I awoke Thursday to yet another glorious morning in San Juan. It was sunny and the temperature was holding steady around 82. I was staying a couple of blocks from Ocean Park Beach, where I’d spent a lot of time dozing and gazing at the view. Tragically, it was the last day of vacation. My flight arrived at JFK in the depths of winter. An 80-degree temperature drop in a little over four hours is no joke. I survived the taxi line and the ride home clad in yoga pants, a tank top, a cardigan, and a pair of flats that still had sand inside. I walked in the door of my apartment and immediately donned silk long underwear, which I have been sporting pretty much ever since. I managed to make the trek up to the Upper West Side that night for the New York Abortion Access Fund‘s Celebrate Access Awards, but there was no way I was leaving my house on Friday. A hearty dish was in order, something that would necessitate leaving the oven on for an extended period of time. I had some French navy beans I’d picked up during a shopping spree at Kalustyan’s and a wide variety of root vegetables from my January CSA share. This plus whatever meat I had socked away in the freezer would surely warm me. 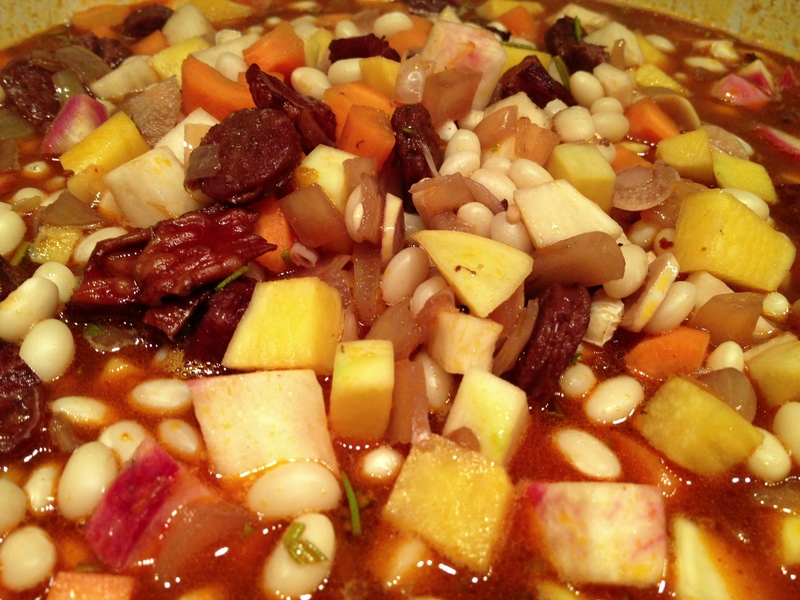 Pre-soak a pound of dried beans for at least six hours and then drain. The aforementioned navy beans were good, but I could see any kind of white bean working. 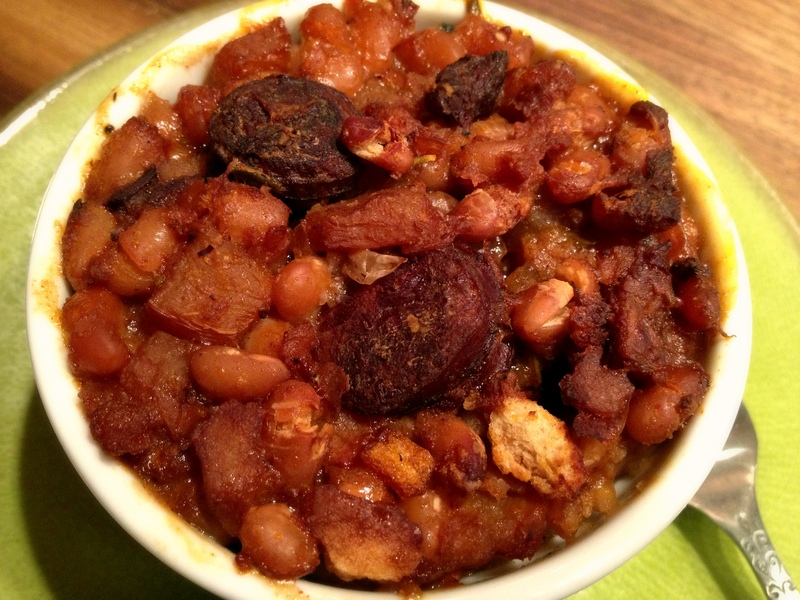 Use black beans, kidney beans, or pintos and you’re veering into feijoada territory. This would not be a bad thing. Render some smoked pork in a large dutch oven over medium heat. I used about four ounces of lean slab bacon cut into quarter-inch cubes. Add some well seasoned sausage and stir while it browns. I went with a few links of Spanish chorizo from Despaña, but Italian sausage, saucisson, kielbasa, or pretty much anything else would work. Pull our your porky bits and reserve. At this point, you could sear off some additional meat–duck, goose, lamb or whatever–in the fat left behind. But I didn’t have any of these and my dish came out A-OK.
Add some onions and/or leeks and cook until they are wilted. I went with three medium onions, diced. Add some garlic (8 cloves thinly sliced in this case) and stir just until fragrant. Scoot your aromatics to the edge and add a couple of tablespoons of tomato paste. Stir constantly being sure not to let it burn. Add half a bottle or more of hearty red wine, your meat, and any stock that you have on hand. (I used some concentrated turkey stock from last Thanksgiving.) Bring to a simmer. Add your herbs and spices. I went with a bay leaf, about a tablespoon of chopped fresh rosemary, a good pinch of red pepper flakes, a tablespoon of hot smoked paprika, and a mix of five allspice berries and 30 assorted peppercorns, which I had ground with a mortar and pestle. Marjoram or thyme would be tasty too, I bet. Be sure to add some salt, although you can add more later. Add a bunch of diced root vegetables. I used six carrots, four rutabagas, and one freakishly large radish. 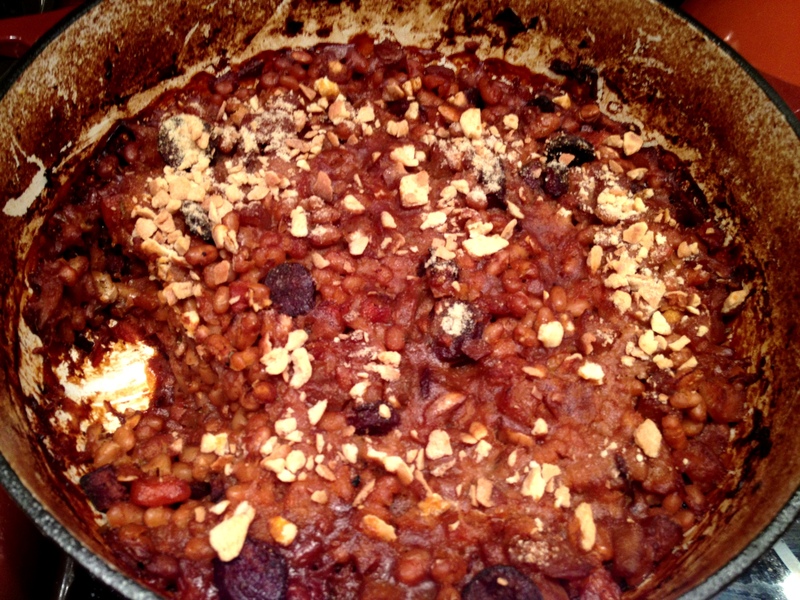 Top this off with enough water that the beans are just submerged and pop it in the oven with a lid. This is what it will look like, more or less. After three streaming episodes of 30 Rock and a couple of glasses of Tempranillo, take the lid off and top with one and a half stale pitas’ worth of breadcrumbs. Dot with some butter, pop it in the oven and watch another episode. At this point, you will have likely consumed the better part of a bottle of wine and could use a little food. Dish yourself a small portion, taste, and add more salt to your bowl and to the pot if needed. Stir in the crust that has formed, a quarter cup of red wine vinegar, and some additional water if it’s looking a little dry. Sprinkle the remaining half-pita’s worth of breadcrumbs over the top and pop it back in the oven, lowering the heat to 300. Stream a couple more episodes while you polish off the wine. Remove your meat and bean casserole from the oven and, regardless of what the Tempranillo is telling you to do, let it stand for at least ten minutes before serving yourself or anyone for whom you have affection. This make a lot of food, as evidenced by this photo of the Dutch oven minus my serving. Fortunately, it reheats brilliantly in the oven. Just stuff some into an individual ramekin, top with some water and bake in the oven until your blog post is done–or until the smell overwhelms you and you decided that you’ve earned a break. This entry was posted in main courses, meat and tagged beans, pork by Jasmine Nielsen. Bookmark the permalink. Also, the perfect post-packing meal when moving apts. Thanks for sharing! this was delicious, i found myself nibbling at it cold. yum and thanks! this was so delicious, i found myself nibbling at it cold. yum and thanks! Happy to contribute to your move in my small way!